Generally, if the glaze surface is rough and dull, not as glossy as expected or the coverage inconsistent, not enough glaze has been evenly applied. The ware may also be under-fired. Running, bubbling and overly glossy is often the result of too much glaze being applied (or over-firing). Greater specifics follow. Any substitution, addition or reduction of materials to any glaze can have multiple effects. Beware and test. As gasses escape from the clay and glaze in firing, the glaze bubbles. Ideally, the out-gassing stops before the firing is complete and the glaze flows to a smooth surface. Too much gas, too stiff a glaze whereby the gasses can't escape through the glaze surface or allow the glaze to heal (flow smoothly together) can cause this defect. Improper firing can also cause this defect if too hot or too fast at the end. The most common cause is too thick a glaze application. Borax, potassium carbonate, magnesium sulfate, soda ash, fluorine and carbonates in general produce excessive gassing. Try substituting other fluxes or use frits. Reducing viscosity and/or surface tension can also help (see chart at the end). First though, be sure the bisque is clean of any dust, the glazed ware has dried completely before firing, the bisque is fired to at least cone 04, the end of a high-firing is not too fast and that the cooling is not too rapid. If possible, add up to a half an hour soak. Most often a problem in clear glazes becoming slightly milky. A magnifying glass can be used to confirm the existence of crystals. When not desired, can be reduced by accelerating the cooling since that is where the crystals form. Also, review the glaze components and reduce crystal forming materials such as zinc and titanium. High silica and alumina also contribute to crystallization. The most common glaze problem, in some senses, it may be thought of as what results when a blistering problem is not entirely corrected in that the glaze has not healed or flowed over the defect. Firing slightly higher or, better, soaking at the end of the firing will usually correct the problem. Also helpful would be applying the glaze more thinly, adding flux to make the glaze more fluid or reducing zinc and rutile which cause excessive gassing. Also, the surface tension and/or viscosity could be reduced by substituting ingredients (see charts at the end of this section) Too heavy or too long reduction is also thought to be a cause in gas firings. See Blistering. Obviously over firing can cause a glaze to run. The glaze becomes too liquid. Reduce flux and/or add 2-5% kaolin. 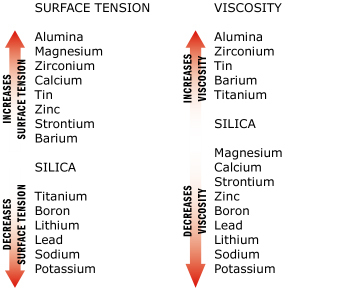 See viscosity chart at end for possible material substitutions. One of the more pervasive glaze problems, crazing or crackling refers to a very fine network of spider-web-like cracks in the glaze surface often only barely visible. It is caused by the glaze contracting more than the clay body on cooling (after the molten state) whereby the glaze is "too small" for the clay. Nearly all materials including glazes and clays expand with the addition of heat and contract when cooled. Crazing can occur while cooling in the kiln or much later when, for instance, hot coffee is poured into a cool cup (the clay expands more than the glaze). It may also occur later in use should water enter the clay itself (through an unglazed area), causing a slight expansion of the clay mass from absorbing the water. The propensity to craze can often be reduced by firing higher and/or longer (idealy soaking at least 20 minutes) and by applying a thinner coat of glaze. Unfortunately, simply firing hotter increases the problem on vitrified porcelains. Obviously, sudden cooling such as opening the kiln or removing peephole plugs too soon should be avoided. Crazing over slip or underglaze decorating can be reduced by thinner application of the slip and sometimes by adding a small amount of flux to the slip (see Underglaze section of Resource Center). The opposite of crazing. The glaze pops off in slivers, especially on thin rims and edges. Over-reduction, especially of red clay bodies which are susceptible to carbon coring may be an additional cause. Reduce low expansion materials. Increase high expansion materials. Increase feldspar. Simply and unscientifically put, surface tension can be taken literally and refers to the phenomenon whereby a liquid, like water, tends to bead rather than spread whereas viscosity refers to the resistance to flow in general (not necessarily "thickness" however).